The 7.5 FK Field Pistol from FK Brno is a beast packing an extremely powerful new cartridge. If you have an extra $7,500 sitting around with nothing to do, it can be yours! It’s amazing how far you can end up from where you began. From the unintended discovery of penicillin to the creation of Superglue during the development of ultra-modern plastics, there’ve been numerous amazingly capable products developed entirely by accident. But what about a product designed for a specific purpose, but ultimately used for a different role? Enter the FK Brno Field Pistol and 7.5 FK cartridge from the Czech Republic. This story begins in the sands of the Middle East. According to FK Brno, the 7.5 FK round was born from a request for a new round by a private security group. The request stemmed around concerns over 9mm handguns and 5.56mm carbines then available. They argued the handguns were too short range for the distances they were facing in combat, and the carbines offered too weak a terminal effect on targets. The group wanted a cartridge offering increased range and power, extending out to even 100 meters. The goals set were for a round shooting no less than 4" groups at 100 meters, a bullet diameter no smaller than 7.2mm, a retained velocity at 100 meters of no less than 1,475 fps, and capable of fitting inside a normal-sized handgun. Pretty demanding, right? Grips are offered in wood, plastic, aluminum and G10. The sample pistol sported red aluminum. A cylindrical sliding counter-weight system lives in the dust cover to help keep muzzle flip to a minimum. The pistol’s 46-oz. weight also helps! The result was the proprietary 7.5 FK round. The bottlenecked cartridge sports a 27mm-long case necked down to a 7.5mm bullet, with an overall length of 35mm. Stated specs for the round are a muzzle velocity of 2,000 fps with muzzle energy rated at 880 ft.-lbs., and velocity at 100 meters of just over 1,500 fps, with muzzle energy rated at 520 ft.-lbs. Bullet weights range from 95 grains to 98 and up to 103. The problem was the new round, while hitting all the points required, proved to be too much for any existing “combat” pistol design. So, they decided to make their own pistol. It was planned to have general dimensions and weight similar to standard-issue military pistols, featuring a double-stack magazine, and “rapid-acquisition” sights usable without adjustment in the 100-meter “range spectrum” of the round. The pistol emerging employed a tilting barrel locking system with the frame wrapping around the slide rails. A double-column magazine offers a capacity of 15 rounds. Controls are a non-ambidextrous frame-mounted safety, slide release and magazine release. The sights are what FK Brno calls its “Butterfly Sight” with three dots — two white in the windage-adjustable rear unit and a red dot on the front. Grips are available in aluminum, wood, plastic and G10 materials. However, the pistol we see here today is not compact ready to be tucked into your pocket for EDC. It features what I would call a “long slide” with a 6" barrel and has an empty weight of 46 oz. The dustcover area of the pistol is oversized and houses FK Brno’s sliding counterweight system. This is designed to help tame muzzle rise and recoil from the 7.5 FK round. The 7.5 FK round was designed to hit hard at long ranges, and the pistol is designed to deliver 4" or smaller groups at 100 meters. The non-ambi controls of the pistol are made up of a frame-mounted safety, a slide release and a magazine release button. Our FK Brno Field Pistol received for testing came with red aluminum grip panels and about 250 rounds of 95-gr. 7.5 FK ammo. MSRP on the pistol is a very notable $7,500. I was immediately struck by one thing when I opened the plastic case. It’s a big, beautifully made all-metal handgun. The machine work on the steel parts is exceptional, and the nitride finish is a deep black. When I handled the pistol, I noted a distinct front-heaviness to the gun — no doubt the result of the 6" length of the barrel and the recoil-reduction counterweight system under the barrel. At the range, I set up on a rest at the bench with a target at 25 yards and started firing groups. I quickly realized the pistol was a shooter, getting sub-1" groups easily, with several approaching 1/2". I pushed it out to 50 yards — the limit of my handgun range — and was able to get groups in the 2" range, consistently. It certainly lived up to its stated design goals. Velocity at the muzzle hovered right at 2,000 fps. Let me warn you, though — you know when you trip the trigger on this pistol. It’s an unavoidable side effect of the cartridge, but there’s noise and blast aplenty. Be ready for it. Also, I found my palm began to “feel it” after a few magazines. Nothing unbearable or unpleasant, but you know when you fire this one. I think a little more rounding to the rear of the grips might mitigate this a bit. By the end of the day, a range buddy and I put around 200 rounds through the pistol, and it performed without a hitch. We did not have any malfunctions and its accuracy stayed consistent. Left: The sights, dubbed “Butterfly Sights” by FK Brno, feature a windage-adjustable rear with two white dots. Middle: The front sight is a simple red dot designed to be easy to pick up with the dual white dots of the rear unit. Right: A single-actiontrigger is housed in a recurved trigger guard. Interestingly, the private contractor requesting the development of the round ended its operations in the Middle East and no longer needed the new round and gun. However, their promise led FK Brno to continue with the project. While initially designed for a combat role, FK Brno recognized the cartridge and gun held a great deal of potential as a long-range competitive pistol and cartridge as well as a capable hunting handgun. You never know where you may end up, right? So, if you’re looking for something truly unique, have tastes appreciating finely made firearms in the Czech tradition, and you have cash the equivalent of a well-used Hyundai Sonata burning a hole in your pocket, then the FK Brno Field Pistol 7.5 FK is definitely worth a look. 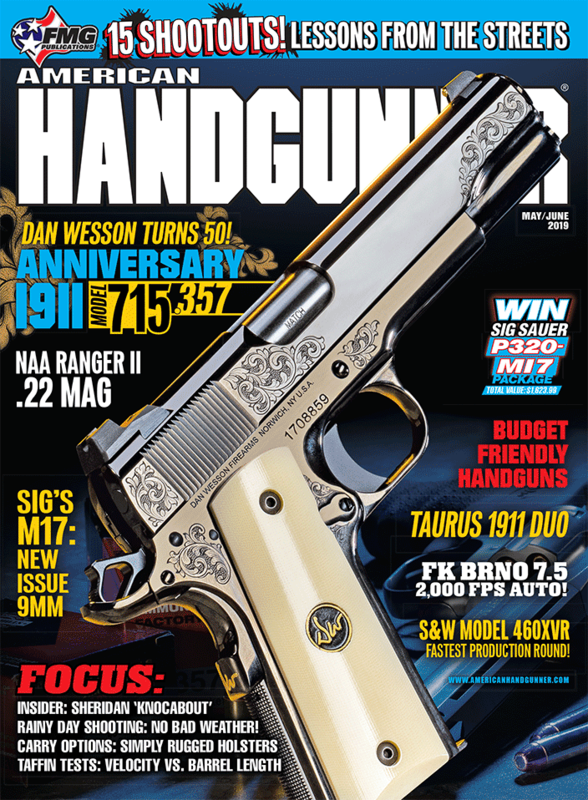 Purchase A PDF Download Of The American Handgunner May/June 2019 Issue Now!